Location: The southern and western parts of the Kharimkotan Island. The structure of the volcano is very complex. "The basal (old) cone has a crudely oval outline, elongate in a north-south direction; its basal dimensions are 7x10 km. This cone is divided into two segments, northern and southern, by two wide, deep depressions, one of which runs to the east and the other to the northwest from the summit. The depressions through which the streams run were formed mainly by explosive means, during violent directed explosions. At the mouth of the eastern depression is a vast debris cone that forms a peninsula 6 km across. There is a debris cone of similar type at the mouth of the northwest depression; it is shaped like a square 3 km on a side. These two debris cones break up the original form of the island and "extend" its outline to the northwest. The sides of the volcanic cone that are not interrupted by the hollows are separated from the debris cones by clearly defined terraces of the old shoreline. The head of the northwestern depression is filled by the remains of a young cone which joins together both segments of the old structure. 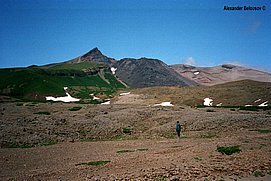 Until the 1933 eruption the young cone was whole and also filled the head of the eastern depression; it rose almost 70 m above the old cone (1213 m above sea level). As a result of the catastrophic eruption of 1933, almost all of the young cone was destroyed and the highest point on the island is now the edge of the old cone, 1145 m. The wide crater formed in 1933, which is open to the east, united with the eastern depression and is now a large amphitheater up to 1.7 km across. The walls of the crater are composed of rocks of different ages: on the north and east lavas and pyroclastics of the old cone are found; on the northwest, pyroclastics of the young cone. Within the crater rose an extrusion dome 2 x 1.5 km across, from which a small flow stretches eastward from the top of the dome to its base. 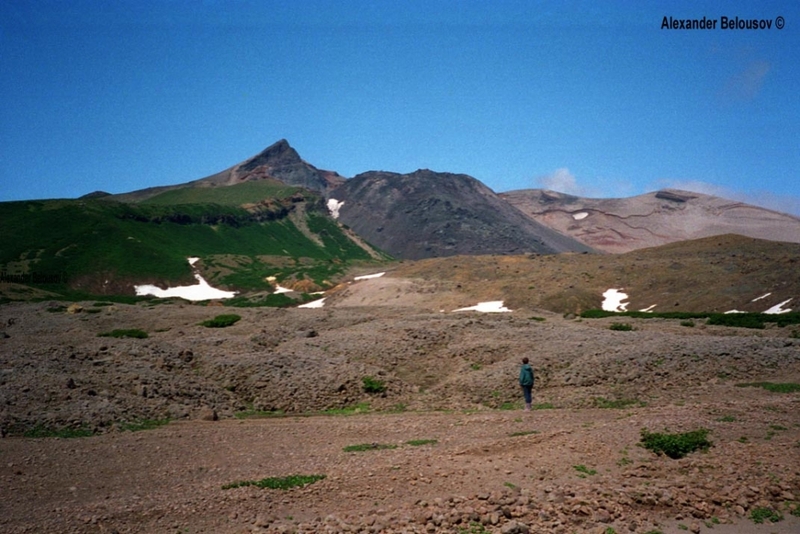 The deposits of incandescent avalanches, looking like lateral moraines, run down to the east from the base of the dome; the whole eastern depression, the adjoining debris cone, and also parts of the old cone are covered with the deposits of a thick pyroclastic flow and directed explosion. Similar, still older deposits are seen in exposures, testifying to repeated explosions in the past. The northwestern debris cone, which was not affected by the 1933 eruption, was formed in the past in at least two stages. Another pyroclastic flow has pushed the shoreline out 1.5 km, leaving behind it the prominent cliff of the old shoreline" (Gorshkov, 1970, p. 111-114).